When phenom photog Courtney Dellafiora entrusted me to bring her “Water for Elephants” wedding to life, the ideas instantly started swirling in my mind… starting with the wonder of how much it would cost to rent an elephant?! Then after putting that dream to bed, I started recruiting a few of my favorite vendors to join our circus! As always, the most important initial decision was our venue! We put all of the pretty plantations and gardens aside for a dusty (and stinky) horse stable! The perfect backdrop for our gypsy bride and groom! I’m all about the juxtaposition of bringing glamorous beauty to such a rough space, so I decided that all props and rentals should be rustic, so that the bride, groom, and their fabulous flowers (thanks Kim Starr Wise) could really POP! We trekked to Slidell to find Lawrence Barattini and his enormous prop warehouse! There we found ripped antique settees, old leather trunks, wood crates, freakishly tall wooden ladders, and an arcade sign among his many thousand other amazing finds! I knew that he could help us set the stage! The rest of our team quickly fell into place! Margaret of Proper Prints would work her magic to create all of our paper and hand painted products! Kim Starr Wise, the magnificent, took my floral sketches and brought them to life! Rich and glamorous red peonies, red anemones, and red roses were collected for event! Mrs. Vintage gave our guests a place to sit with her mix matched wooden chairs! Event Rental erected our red and white striped circus tent! We were ready to transport our bride and groom back in time! When I heard the news that Wedding Sparrow wanted to feature my styled shoot on their international stage, my heart and soul fluttered in the wind just like the ribbons on this dress! And I couldn’t imagine anyone better to capture the beauty through her film camera than Greer of Greer G Photography! Here’s my design inspiration from falling in love with the dress to the full styled shoot coming to life! See the Wedding Sparrow feature HERE! When designing this shoot, it all started with the dress! I fell in love with the romantic embroidered lace and the dainty little sleeves of the Lula Kate L’Amour gown! It had this perfect, simple ribbon just draping down the dress! So was born the inspiration for the shoot! We wanted the design to have fluidity and movement- with a touch of the ribbons threaded through each dainty detail! I chose the Pitot House, a historic home that belonged to the first mayor of New Orleans, as the setting. It has a Southern plantation flair amidst Bayou St. John! Their blue footbridge stood as the setting for our ceremony! One of my favorite touches is the velvet embossed place card ribbons that marked each guests seat with their initials! It was a fun DIY project (requiring just a few easy items and steps) made for an intimate wedding! I also tied in a french blue velvet ribbon embossed with the bride’s initials for her bouquet! Another trend that we are especially enjoying here in Nola is the wedding mixologist who can create a custom craft cocktail for the festivities! Our shoot featured Heirloom Cocktail who created a spin on a New Orleans classic! In all, we created a shoot that displayed movement through the dresses amidst the movement of the moss and southern charm! A pretty picture of feminine beauty and romance! I have a confession to make (that I’m sure you are all well aware of! )– I am a huge sucker for all things soft, dainty, and vintage! So when I got a call from a stranger who had the brainchild of a vintage rental company in New Orleans, I just knew that I had to learn more about her and the company she called Mrs. Vintage! After a coffee date with Mrs. Vintage herself, we decided that the best way to feature her items and her brand new company was to design a shoot around vintage romance! I grabbed one of my favorite photographers (Greer G) and one of my favorite couples (Lindsay and James) and we set a date to bring Mrs. Vintage to life! Below is the gorgeousness that we created for her debut! I’d like to formally welcome you to the place where the Great Gatsby meets our modern day bride… our 1920’s styled shoot at the Bombay Club in New Orleans! With the vintage trend being SO HUGE right now, Magnolia Pair Photography brought a brilliant concept to the table- bringing the vintage feel of the 20’s to the future! This concept was right up my alley! You know how much I love personalizing weddings and adding that something different that sets each brides wedding apart from the next! So I jumped all over it! I brought some incredible vendors together to bring our dream to life! These gorgeous pictures wouldn’t have been possible without them and I thank them for everything! 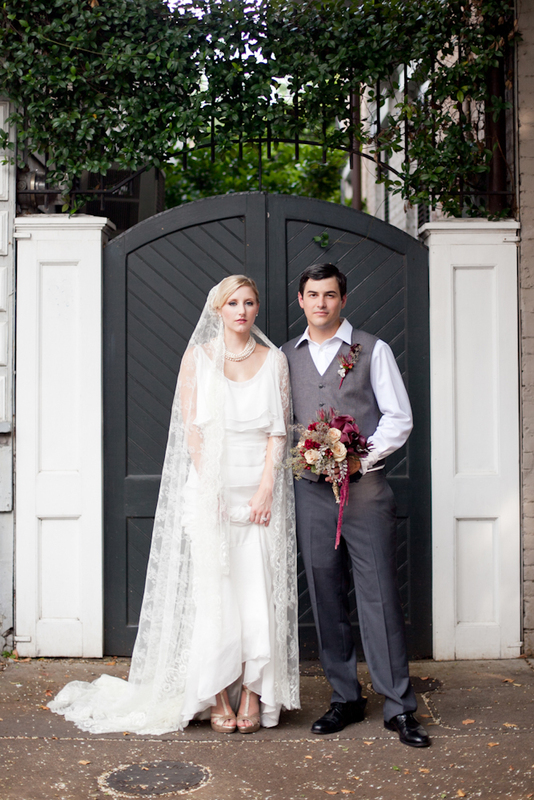 So without further adieu…the whole set of our timeless 1920’s styled shoot!